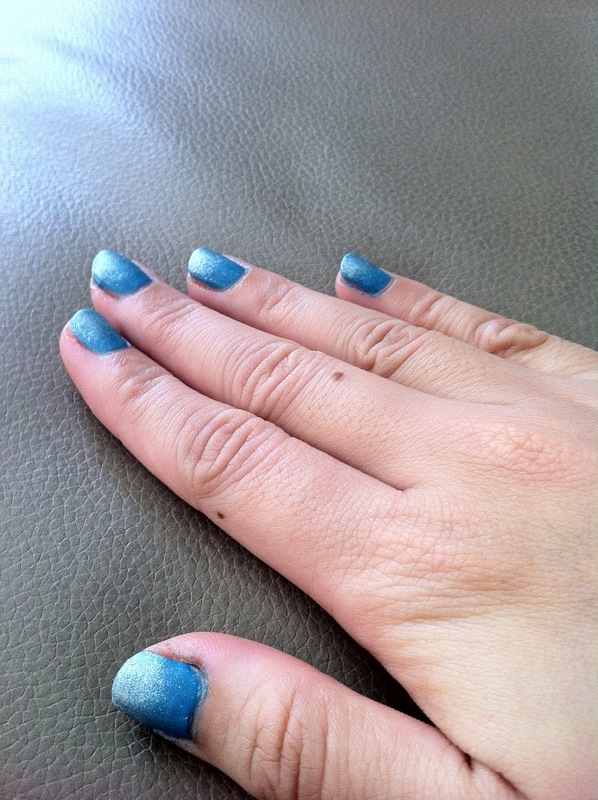 I wore my last manicure for 2 days before refreshing them. 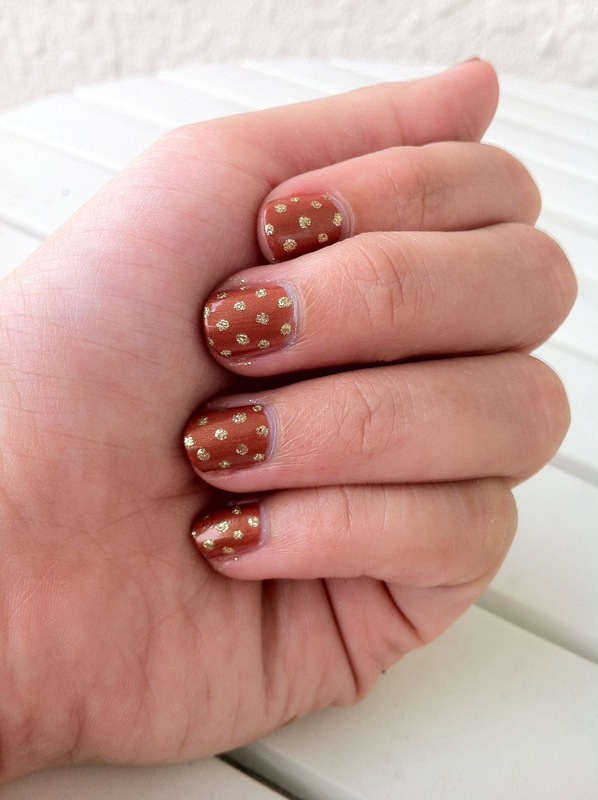 This time I decided to go with a simple accent nail. 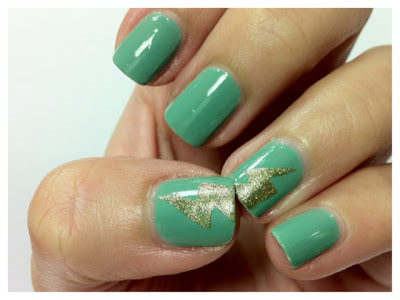 I remember a simple tape manicure at Nailside and thought that I should give it a go. I decided to go Grecian and picked gold for my lightning bolt. Zeus would be proud! 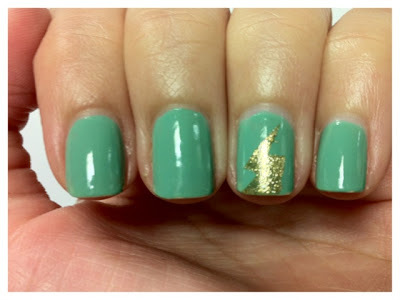 The first two photos were taken under a white light while the next two photos were taken under a more yellow toned light. Which do you prefer? 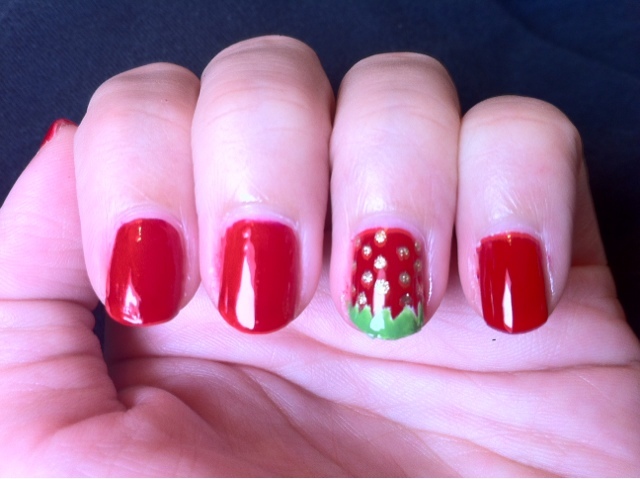 I painted my nails red the other day and decided to add an accent nail to it. 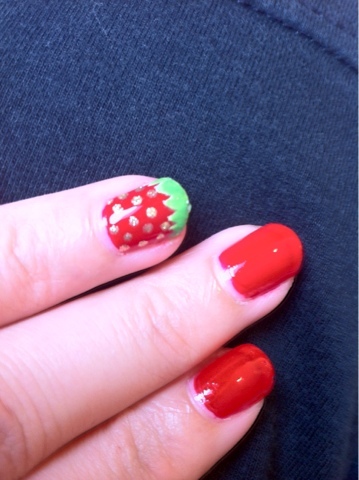 Summer is here and strawberry season is just around the corner, so I thought to do a lil accent nail the best way to add a lil something to my nails was to paint me a small strawberry while I wait for my chance to pick some actual strawberries up! 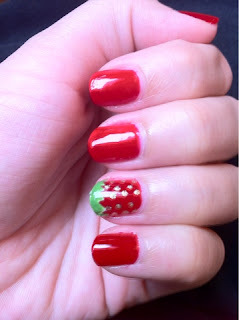 I picked OPI Big Apple Red as my base and added the strawberry on my ring finger using a white striper by Precision, OPI Green-wich Village and Gold Pedicure Sparkle from Skin Food for the seeds. 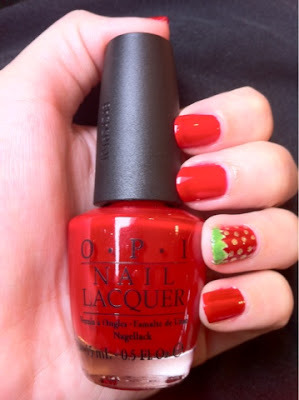 Big Apple Red is a rich creamy red polish. It applies flawlessly in 2 thin coats but if you want more depth just add a third and you’ll see how the color changes to a deeper red. Photographing Big Apple Red wasn’t easy to do at all! 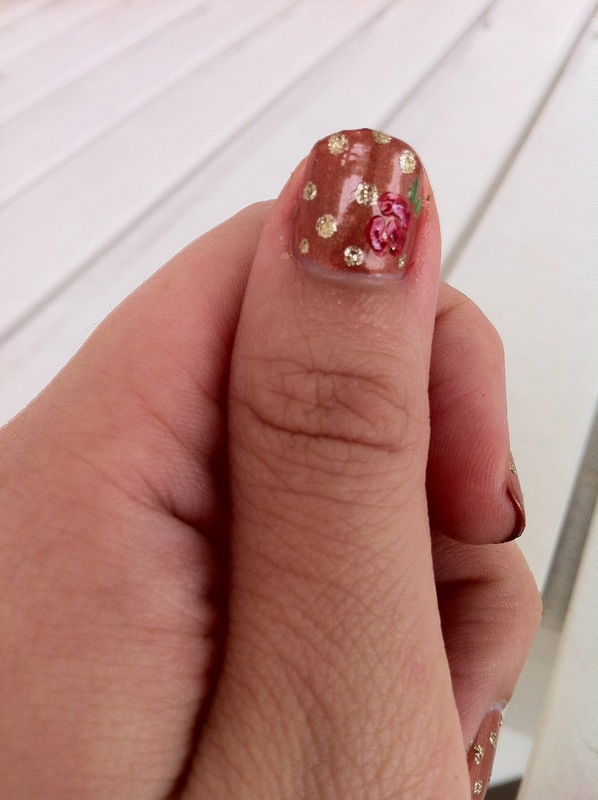 My camera just wouldn’t capture the richness of the polish. I took photos of my hand against a white back ground and almost all of it came out way too dark in the photos. How dissapointed I was. I even tried taking the photos with natural light, yellow light and even took some in my bathroom! In the end, I took the best shot when I had given up. The shot on top was the first shot I took on a black backgraound and the colour is almost as it is in real life. Up close on my little strawberry accent finger. 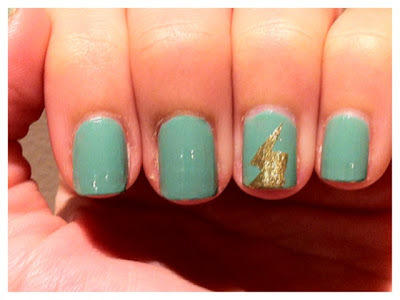 This shot was the total opposite and produces a more yellow tinge to the nails. More shots in differernt lighting after the jump! The weekend is here! And with that I have some freshly painted nails to ring in the weekend! All I have planned for the weekend was drinks with my friends so I decided to do some gradient manicure. Glitter gradient tips. 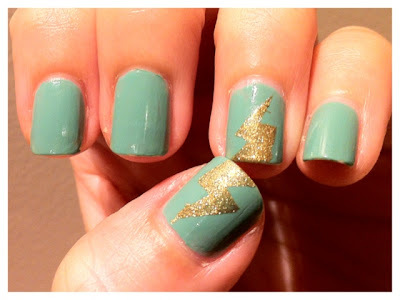 A manicure which I am quite in love with! 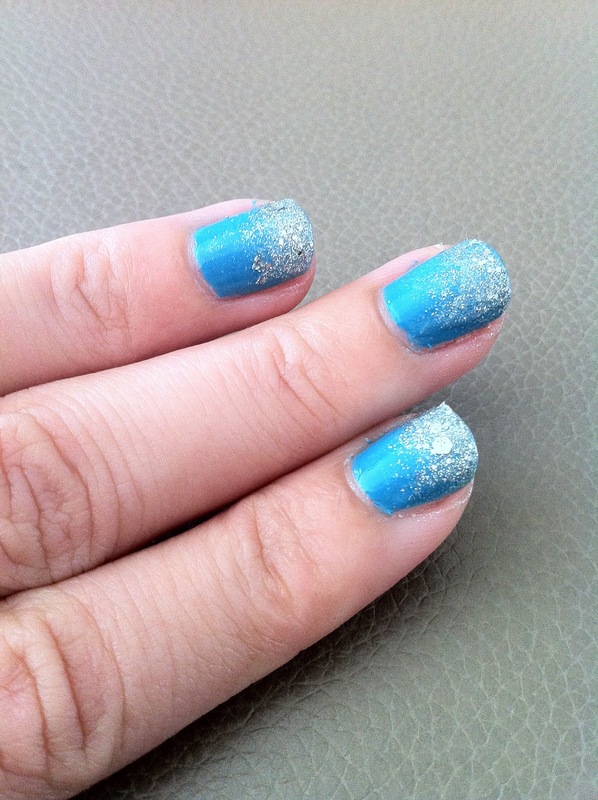 It gives me the chance to use my lovely glitter polishes without looking like a over-the-top party girl. I chose China Glaze’s Flying High from the Up and Away collection for the base and sponged on a silver base from Skin Food Pedicure Sparkle and topped it off with a layer of OPI Crown me already. 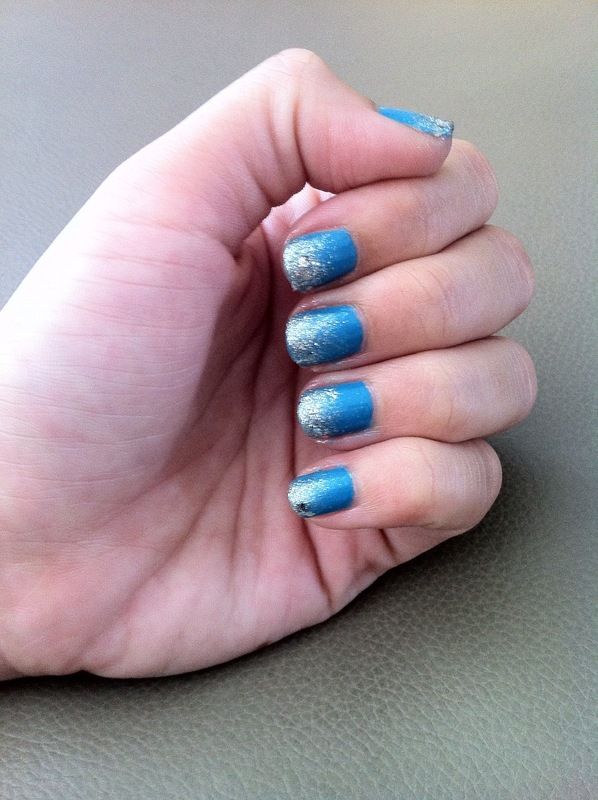 I love how the nails look kinda winter-y although it is not winter anywhere! Except for my office which always has the aircond on full blast even when it is pouring outside!